I’m not ready to bring out the pumpkins but September needs a little touch of something. I’m working on this wreath. 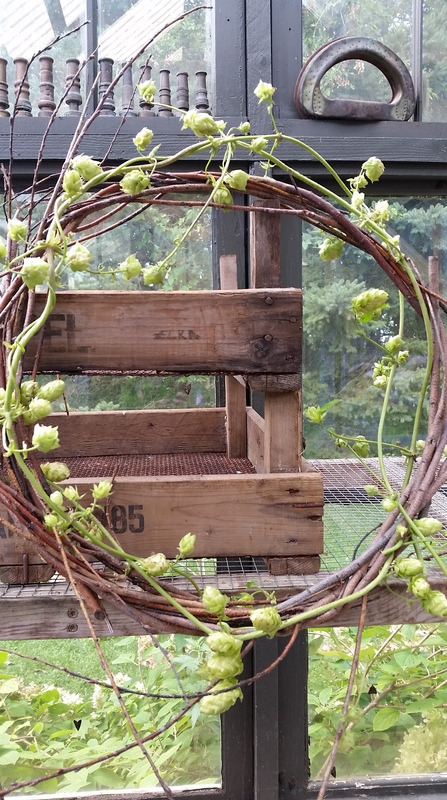 A grapevine wreath that I started in the spring and some Hops vines that I’m trimming. See those pesky moths in the greenhouse? More moths than I have ever seen out here. I miss my ducks and chickens, they would have loved the snacking. Chickens are great pest control, too bad everything likes to eat them! I do miss the girls! Happy September Eliza! Thank you, Stacey, same to you! Where did the summer go? September has become my favorite month! Love the natural touches to start the slow change to autumn. Happy September to you Becky! Yeah, what is it with the moths this year? We have them everywhere in our yard. I’ve never seen so many either. Isn’t it weird Audrey? I don’t ever remember seeing this many, though it was just me, but everyone is mentioning it! I happen to watch a scary movie a few weeks ago and it had giant moths in it!!! Love the wreath. What happened to your ducks and chicken? I must have missed that post. Becky, last fall the mama ducks were killed off by Coyotes. It was very sad. I was left with 4 papa ducks so I gave them to another farmer that needed some boys. This summer raccoons broke into the chicken coop and killed that last of my 4 hens. They had been with me for nearly 8 years. I sure miss them scratching around the yard and garden. All summer long they had decided they liked to roost on the deck each night and I had to carry them to the coop each night to go to bed! They were so tame and were pets. I sure struggle with the loss of any of my animals. Thank you for asking. Maybe a few new chicks in the spring. Shhh don’t tell my husband.